Whether brushing is indeed a skincare breakthrough or just a trend, it is important for those with acne-prone skin to be aware of the positive and negative aspects associated with brushing before making a decision to add another element to your skincare ritual. Here are just a few. Exfoliation. Keeping pores clear of dead skin cells is an important aspect of skin care for the acne-prone. The combination of excess sebum and dead skin cells is what clogs pores and leads to breakouts. When we exfoliate the surface of the skin regularly, we have a better shot at remaining blemish-free (though this is only half of the solution). Pairing the exfoliating powers of a brush with a systemic treatment (like AcnEase®) designed to target the source of the problem, the overproduction of sebum, is your best bet for remaining acne-free. Improvement of skin texture. Acting as what is essentially a mini-massage, the surface of the skin is stimulated, which increases blood circulation, resulting in a rosy glow, and a softer, smoother dermis over time. You may experience an influx of breakouts. Because the circular motion of the brush head sloughs away dead skin, these cells can plug up pores. Despite cleaning the surface, the production of sebum is still fully functional beneath the surface, which makes brushing alone a temporary solution. With regular use, the breakouts may become less frequent. 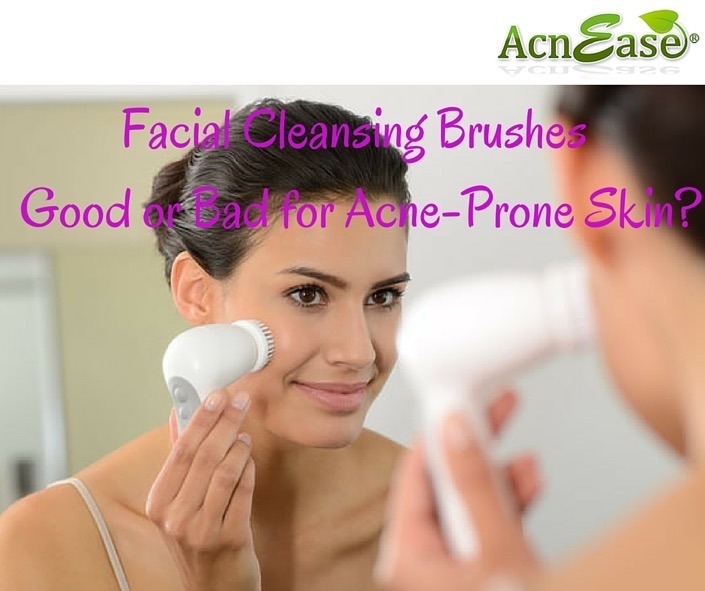 HOWEVER, if you have cystic acne, brushing can not only harm the existing cysts, but also allow more bacteria to enter the pores, so it is really not for you. Over-drying. Along with dead skin, brushes can also rid the skin of the oils necessary to maintain a healthy complexion. While acne is believed to be caused in part by over-productive sebaceous glands, users should aim to balance the production of sebum, rather than rid the skin of all oil. Brushing is a good way to feel squeaky-clean, but lasting solutions are seen when we treat the problem from within our body. Following the major success of early brands to hit the market, there are now many options to choose from. The two types of skincare brushes available, sonic and rotating, both feature nylon bristles. The sonic brush oscillates back and forth at a rate of 300 motions per second while the rotating brush moves in a circular motion. Facial cleansing brushes typically range in price from as low as $15 for a drugstore design, to over $100 for a higher-end model. When it comes to using a motorized tool to clean your complexion, it is not recommended to skimp on this purchase, as you really do get what you pay for. Using a brush can be a beneficial supplement to an existing skincare regimen. Users and developers alike suggest gradually introducing the tool into your routine, starting at once a week, and adding use until the right amount for your skin is found. Most dermatologists recommend a maximum of three days a week. It is important to stick with a gentle facial wash, free of exfoliating beads, as too much exfoliation can break down skin tissues which can lead to inflammation and irritation. Always remember to moisturize and be sure to replace brushes every three months for the best results. Exfoliating the surface is a good step in helping your skin remain healthy and free of breakouts. However, “treating” not “helping” is a key word here as retaining clear skin requires that the problem be addressed at the source, among the oil-producing sebaceous glands. AcnEase® is a 100% herbal formula, used to treat acne at its source as it works to prevent the outward symptoms of breakouts. AcnEase® works to manage the relationship between hormones and sebaceous glands, allowing the glands to produce oil at a normal rate, naturally eliminating acne symptoms and simultaneously preventing new breakouts. If you’re thinking of adding a facial cleansing brush to your skincare routine, pairing it with a systemic treatment such as AcnEase® is your best bet for achieving and maintaining clear, healthy skin. We want to hear what you think! Do you use a facial cleaning brush that you love? Did you have a bad experience with one? Tell us in the comments below!